The blessing and curse of real estate is that trends develop slowly. This makes them easy to catch, but also easy to miss … unless you make it a priority to pay consistent attention. We scour the news daily. We’re always looking for opportunities, lessons, and trends. But they’re not always obvious. In fact, they usually aren’t. So it’s not answers we’re looking for. It’s better questions. The clues in the news simply capture our attention so we can dig deeper. And because real estate trends move slowly, there’s often plenty of time to investigate … and then move into position to take effective action. Now Salt Lake City isn’t necessarily a market normally associated with diversity, but according to this report, it’s tops for diverse job opportunities. Of course, jobs are uber important to real estate investors. After all, jobs are the best way for tenants to get the money to pay rent. Plus, any market with abundant jobs is going to attract more people … adding to the demand for rental properties. Perhaps even more importantly … a diverse selection of job types is probably a good indication an area has multiple economic drivers. Economic diversity is a very important component of stability and resilience. This should be obvious, but it’s amazing how many investors rush into markets chasing a trend driven by only one big story. Of course, if that one big story changes for whatever reason, then so does the trend in the market. Consider how things worked out for real estate investors who rushed in for the oil boom in North Dakota’s Bakken or the Amazon HQ2 boom in New York. Time will tell, but we’re guessing while some Opportunity Zones will be fantastic successes … some will end up being big busts too. One story usually isn’t enough. And there’s no need to move too fast when it comes to catching an uptrend in a real estate market. Sure, when you take a measured approach, you might miss out on quick gains gleaned from front-running the fast-to-act speculators. But if you view real estate as a long-term investment, then you’re looking for long-term trends. Best to let the trend strengthen before getting in too deep. Besides, there’s plenty to do while you’re watching the trend develop. Consider our approach to Salt Lake City … since this is the focal point of the headline we’re talking about today. Salt Lake City popped up on our radar a few years back and we started watching. The more we saw, the better it looked. In 2017, Salt Lake City appeared in a report of metros with a low percentage of rent burdened population. Markets that looked interesting based on this metric were Kansas City … along with Oklahoma City, Cincinnati, Louisville, and Salt Lake City. Since then, and perhaps to no surprise, we’ve built relationships with boots-on-the-ground teams in both Kansas City and Salt Lake City. Sometimes it takes time to identify and study a market, then get to know the right people … rather than just jumping into a “good” deal in a “hot” market. … so it’s wise to get good at seeing opportunity, doing your homework, and building relationships sooner. But again … the blessing of real estate is it moves slowly. So you don’t have to be a racehorse to win the real estate investing derby. Nonetheless, you do need to move. You can’t win or finish a race if you’re still standing at the starting gate. So when you see a positive market metric, be quick to start the process of exploration … but cautious about leaping into a deal before you look. And as you explore a market’s potential, whether you’re just starting out or already have a sizable portfolio, consider how to use diversification as a tool for building resilient wealth. Choose economically diverse economies to reduce your exposure to any one industry or sector of the economy. Invest in multiple units when you can. More doors provide multiple streams of income and less dependency on any one tenant. Invest in multiple markets. Even diverse individual economies can suffer setbacks, so being in more than one market can help mitigate the risk. Syndicate or invest in syndications to become even more diverse faster. Syndication pools your money with others’ … and provides scale you might not have on your own … so you can own more units, in more places, with professional management. The bottom line is real estate is a great “basket” to put all your eggs in … while also providing the ability to create resilient wealth through strategic diversification. One of the primary purposes of easy money (“quantitative easing” or QE) is to inflate asset prices, bloat balance sheets, and create a wealth effect. The formula is simple. Print gobs of money, buy bonds to drop interest rates, and flood the markets with liquidity. Corporations borrow cheap money to buyback stocks … pushing stock prices up and triggering big bonuses for execs. Corporate raiders borrow cheap money leveraging operating cash flow into leveraged buyouts … triggering mega-mergers and acquisitions … and fat fees. Real estate investors borrow cheap money … leveraging rental income into big mortgages … bidding up prices, creating lots of equity, and compressing cap rates. Even everyday homeowners get in on the action … borrowing cheap money and leveraging their paychecks into big mortgages … pushing up prices and creating lots of equity. And some of the equity boom in real estate comes from folks moving some of their stock equity into fancier houses. Of course, from a portfolio management perspective, it’s probably not a bad idea to reposition fickle, volatile paper equity into boring, stable real estate equity. For those with real estate equity in bubbly markets, it’s probably a good idea to consider repositioning some of that equity into less bubbly real estate markets. After all, if quantitative easing was about inflating asset prices … what’s the likely outcome of quantitative tightening? Right now, the Federal Reserve is raising rates and shrinking its balance sheet … which is the OPPOSITE of what they did to inflate asset prices. So it’s reasonable to be concerned about the equity on your balance sheet. If the prices of your stocks and real estate fall, so does your equity. This all begs the big question … how can you protect your equity from bursting bubbles? Aside from selling everything and sitting in cash … which has its own risks … one strategy is to simply reposition equity into assets which are less affected by leverage. It’s why Jim Rickards (Currency Wars, Death of Money, Road to Ruin) recommends allocating a portion of your balance sheet into real assets, including gold and unleveraged real estate. Of course, these strategies are easy to talk about. But in the real world, it takes some work to actually implement them. And it starts with education. But you’ve read this far, so you’ve already begun the process. Good job! We get into much greater detail in the Future of Money and Wealth video series. In fact, in module 13 of 20, there’s a detailed strategy (too big to explain here) for repositioning equity for wealth preservation, privacy, and increased cash flow … and some other VERY cool benefits. But there’s more to protecting equity than simply understanding a strategy. If you’re going to move equity from highly-leveraged stock or real estate markets into less-leveraged real estate markets, you’ll need to find and learn those markets. One of our favorite un-leveraged real estate markets is Belize. There’s a long list of reasons why we like a very specific market in Belize, including the fact it’s not leveraged … yet. That’s because getting wealth into non-leveraged real estate markets insulates your equity if credit markets seize up like they did in 2008. Sure, you could get loans in Texas … but Texas law restricted some of the more aggressive lending. So less air got into Texas values. That’s a big reason why the Texas markets didn’t bubble as much as other markets, which made it boring pre-crash … but VERY attractive post-crash. Well, Belize was even MORE stable than Texas going through the crisis … and that was before Belize had as much global exposure and demand to prop it up as it has today. We thought Belize made sense heading into back then and we like it even better today. That’s why we continue to share it with people through our discovery trips. It’s not for everybody, but we think everyone would be wise to take a closer look. Last year, Hilton Hotels decided to plant a flag in Belize. Marriott just announced earlier this year. Big players like this little market for a reason. When you see big brands making moves into a market, it’s a leading indicator of market strength. And when you have a chance to get in a market BEFORE leverage arrives, you have a good chance of catching a big equity wave. Of course, if the leverage never happens … you simply have a chunk of your wealth parked in a stable market with some VERY desirable lifestyle perks. So whether you do it in your own account or with partners through syndication, Belize is a market to consider right now … and you can learn all about it on our next fun-filled discovery trip to beautiful Belize. We’re sure you’ve noticed the upheaval certain areas of the U.S. … it’s been hard to miss. Hurricane Harvey and Hurricane Irma have swept Texas, Florida, and the Caribbean, leaving a path of destruction in their wake. Every natural disaster brings a certain amount of tragedy, and our sympathies go out to those who are hurting from the storms. But we’re heartened to see communities coming together in the aftermath to help heal damage … and we think real estate investors can play a role in building communities that are even stronger than before the storms. Listen in to this episode of The Real Estate Guys™ show to hear us brainstorm ideas about how investors can help … and how they can prepare for future disasters. Perhaps it makes you uncomfortable to think of profiting while people are suffering. That’s okay. In fact, it’s more than okay … it means you have the right intentions. But bringing your skills on to the scene after disaster has struck isn’t simply opportunistic. By getting involved, you’re solving problems and adding value. This is the sunny side of capitalism. You can make a fair profit … and make a difference too. Just make sure you’re doing the right thing for the right reason. Remember … the flip side of every problem is an opportunity. In the aftermath of a disaster, there are myriad opportunities. 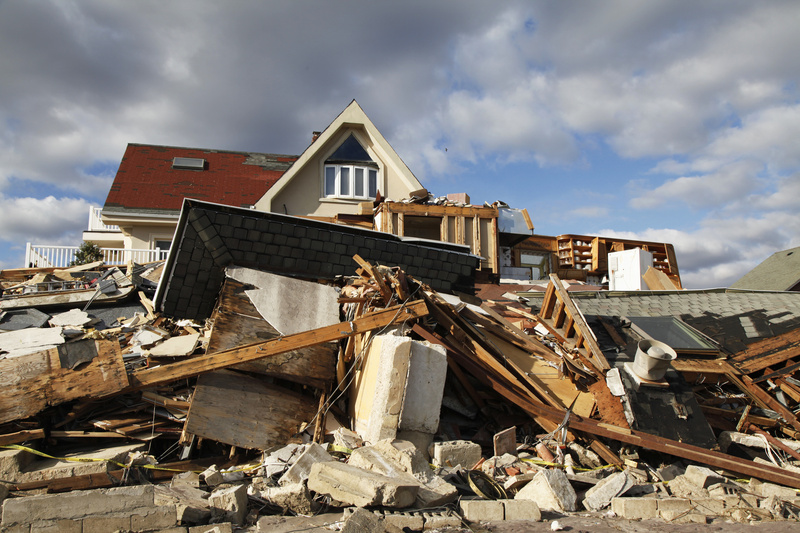 Investors can renovate flooded and damaged houses. Some houses will be lost causes until an investor decides to step in and put some capital to work. Out of necessity, huge disasters involve a large displacement of people. Investors can create new housing situations for displaced people. And disasters also effect the local economy. Jobs are affected, causing a ripple effect for entire communities … including landlords whose tenants’ jobs are affected. Finding ways to revitalize local communities and create jobs can minimize damage and create huge amounts of good. Getting involved simply because there is an opportunity isn’t always the smartest choice. Make sure you’re getting involved because it makes sense and it’s the right choice for YOU. Investors have to know that after a major disruption, banks, government agencies, and other financial institutions may create incentives to sweeten the deal and get people involved. After Hurricane Katrina, the Louisiana government created a “go zone” with adjusted depreciation rates. These incentives can make investing in disaster-struck areas a smart idea … but we’d warn you to never let the tax tail wag the investment dog. It’s easy to get caught up in a temporary disruption and make a long-term commitment without realizing that circumstances may revert to what they were pre-incentives. With that said, Houston is a favorable market … it’s landlord friendly, with many major industries creating jobs. Most of the things that make Houston make sense haven’t changed. And if you want to invest there, there’s no better time than now. It may be smart to be the first to make a move … while everyone else is still panicking. Let’s look at properties that fall into distress. Maybe the owners got stuck in a bad situation. Investors can step in pre-foreclosure, buy the home, rehab the property, and put it back into service. You’re doing good by helping the owners before they’re foreclosed on, and you’re making the neighborhood a better place … all in one fell swoop. You’re making a difference on the micro scale. The same idea works on the macro scale … when disaster strikes a whole community instead of a single person. Disaster-struck cities will have blighted areas. Many may have been functionally obsolete even before the storm. Now is the time to redevelop and rebuild … to create great neighborhoods where none existed before. It wouldn’t surprise us to see entire neighborhoods change composition if real estate investors have the good sense to identify trends and get in on investment opportunities early. Perhaps you want to help pick up the pieces … but you’re not sure where to find the capital. Incentives can help. You may also want to consider community banks, who will be eager to get investors on the scene as early as possible. There’s lots of capital out there. Not all of it has to come from banks, though … syndication is another great option. Running syndication deals in disaster-struck areas gives people a great opportunity to put a chunk of cash to work. Instead of donating a small amount and getting nothing back, investors can see their money do good … and also make a decent profit. Entrepreneurs look for a market problem and figure out a way to solve it … profitably. Look for ways to solve problems instead of despairing about everything that’s gone wrong. A big part of dealing with disasters … perhaps the biggest … is being psychologically and financially ready to step in when the next opportunity comes along. Always be prepared. If you own properties, make sure you have the proper insurance in place. Never risk 100% of your net worth. Always ask whether you’re taking too much risk before jumping in to a deal. If you want to be a first responder next time disaster strikes, it’s smart to have a source of capital ready to deploy when the right opportunity comes up. If you know you won’t have enough capital on your own but think you’re the right person to syndicate a deal for other investors, build your network before the right opportunity comes along. Build your brand and your credibility. That way, you’re not running around looking for people to invest when the time is right. Just like the Boy Scouts, we’d encourage you to always be prepared. Make sure you’re aware of all possible downsides. Don’t go in looking for the upside first. That doesn’t mean you should be afraid to jump in when the time is right … absolutely move while the situation’s still hot, but make sure you’re making a smart, calculated risk. And don’t bet the farm on a single deal or market. “Get rich in a niche” is a classic piece of advice for almost any profession. Specialists almost always make more money than generalists. On today’s show, The Real Estate Guys discuss one of the most unique niches in real estate niche: lodging and hospitality. While the hotel business is flat and financing is almost non-existent, we discovered the picture is quite different in the boutique space. We also contrasted the condo-hotel model (think City Center in Las Vegas) to the concept of “fractional” ownership. We’ve heard great things about fractional structures and Ed was able to share some interesting and valuable perspectives. There’s no substitute for 35 years at the center of an industry when it comes to being aware of cycles, distinguishing between fads and sustainable trends, and having one’s thumb on the pulse of a niche market. We closed, as always, asking where the opportunities are for today’s investor and Ed gave us some great ideas to think about!